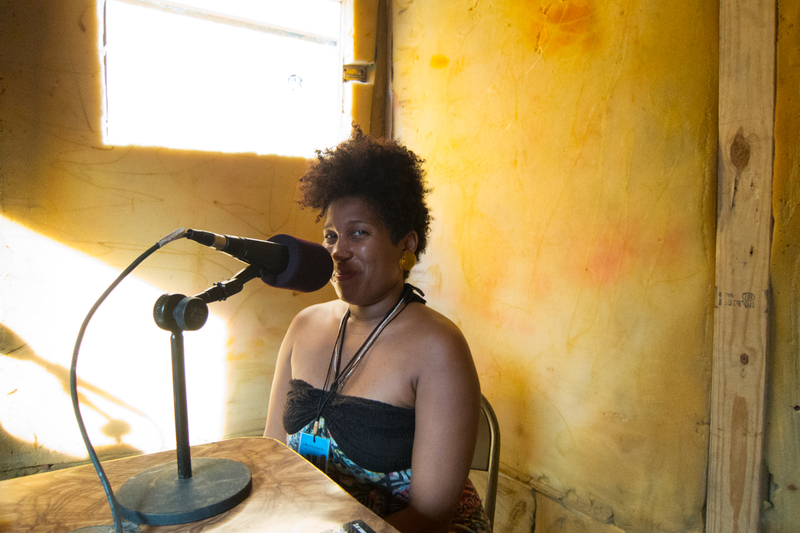 Jake Nussbaum and Richard Fleming host painter Zeal Harris in the Radyo Shak at the 2015 Ghetto Biennale, to discuss her project Following Zora, aka Miss Hurston. Harris's project draws from the written accounts of Hurston's own travels to Haiti, a path that Harris ties to the tradition of Black American pilgrimages throughout history. The novelist's depictions of vodou ritual (she may even have been initiated as a mambo high priestess on her trip) particularly influenced Harris's already spiritual and symbolism-rich paintings. Harris also tells of her impressions of Port-au-Prince on this, her first trip to Haiti, where she finds inspiration in the constant creation of art outdoors in the streets, from wall paintings to elaborate decoration of public transportation, talismanic sculpture, and embroidered flags.